Use single-speed winches for sheets on very small boats and for halyards on small- and medium-sized boats. They are also useful for a variety of control functions on many boats. 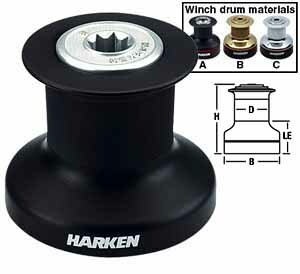 Harken single-speed winches are the finest small winches made. They feature all-metal bases and bushings or bearings where other brands use plastic bodies and no bearings. The B6 and B8 feature a simple Delrin®-bearing sleeve. This bearing is almost maintenance free and requires only occasional cleaning. These winches are ideal for small daysailers and pocket cruisers who want to avoid the hassle of pulling direct from the sheet. Use for: Halyards, Sheets, Control lines. Features: Drum diam. (in) 2 3/8; Base diam. (in) 3 9/16; Height (in) 3 1/4; Weight (lb) 1.6; Line entry height (in) 1 5/16.